— So far there are 46 House seats where an incumbent won’t be running for reelection in November. That is already above the postwar average, and more open seats are likely. — The current list of retirees includes 31 Republicans and 15 Democrats. Wave years sometimes but not always feature such a disparity between parties. — Of the 46, the Crystal Ball rates 18 as competitive. The seats likeliest to flip generally are held by Republicans. — In order to win the House, Democrats should net a half-dozen or more seats out of the total number of open seats. — But that’s only a portion of the 24 seats they need to win the House, so in all likelihood they still will need to defeat somewhere around 15-20 GOP House incumbents to win a majority. But that is not that high of a number historically. — Six ratings changes this week all benefit Democrats. They are explained below. Last week’s retirements by two prominent Southern California House Republicans, Reps. Darrell Issa (R, CA-49) and Ed Royce (R, CA-39), brought attention to a growing exodus by House Republicans from Congress. These retirements likely will make it harder for Republicans to hold the House, although in most instances the retirements should not affect the general election odds because so many districts are safe for one party or the other. The number of House members who are not seeking reelection to their seats is already high historically, though. As of right now, there are 46 seats that will not have an incumbent on the ballot this year, and 389 where the incumbent is seeking another term. The number of House seats featuring incumbents is already well below the post-World War II average of 397 per election, according to Vital Statistics on Congress, and with filing deadlines still months away in some states, the number of open seats seems almost guaranteed to rise. There is a decent chance that we could see the second-fewest number of House incumbents running in the postwar era: just 382 ran in 1978, so seven fewer than are currently running now. Given the usual pace of House retirements, we could see several more that push 2018 below that total. However, one doubts that 2018 will match or exceed the postwar low, 368, in 1992. Redistricting and the House banking scandal contributed to the high number of members who did not seek reelection. Another factor may also have been the ending of an almost unbelievable perk: 1992 was the last year eligible House incumbents could keep campaign money for personal use following retirement (yes, really, that used to be legal). Two-thirds of this cycle’s open seats — 31 of 46 — are held by Republicans. A lopsided number of open seats in one party’s direction can sometimes be a sign of trouble, and it stands to reason that House members, who out of necessity are often among the most informed and perceptive analysts of politics around, might sense when things are going south for their party. Members in vulnerable seats may retire so they can leave on their own terms instead of taking the risk of losing; members in safe seats may dread serving in the minority. Still, there are structural factors at play here, too. One would probably expect Republicans to have more open seats in 2018 regardless of the political environment because the party won 47 more seats than the Democrats last year (241-194), so there are just more Republicans who could opt to not run for another House term than Democrats. Another structural issue that may be driving some retirements is the term limit that the Republican caucus imposes on committee chairmen: eight of the 21 standing committee chairs are retiring and five of them were going to lose their chairmanships next year because of term limits, according to Roll Call’s David Hawkings. Finally, a few of the retirements are directly tied to credible sexual harassment allegations, which have rocked powerful men in many different professions. One other consideration is that many “retiring” members on both sides are actually seeking other offices as opposed to leaving public life: That’s the case for eight of the 15 departing Democrats (including Maryland Rep. John Delaney, who is already running for president) and 12 of the 31 exiting Republicans. Members who leave the House to run for something else tell us less about their perceptions of the overall political environment because they are remaining in the political game as opposed to calling it quits. Right now, we have 18 of the 46 open seats rated competitively — meaning something other than a “Safe” rating. Table 2 shows those seats ranked in the order of vulnerability. So the first seat listed is, to us, likelier to flip than the second, and so on and so forth. Note: See the “P.S.” section below for more details on how we made this list. Of these 18 seats, 13 are held by Republicans, while just five are held by Democrats. Additionally, the five seats likeliest to flip are all held by Republicans. 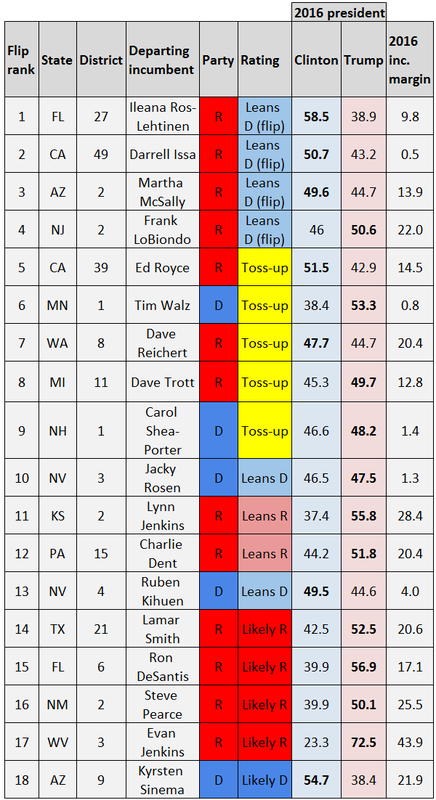 That includes four GOP-held seats where we now see the Democrats as favored: FL-27 and CA-49, which we moved to the Leans Democratic column after the incumbents retired, as well as AZ-2 and NJ-2, which we are moving as part of this update. Let’s address those first. Now that Rep. Martha McSally (R, AZ-2) is officially running for the U.S. Senate, her very competitive, Hillary Clinton-won swing seat is open. Republicans appear to be rallying around Tucson Hispanic Chamber of Commerce President Lea Marquez-Peterson (R) as their nominee, while former Rep. Ann Kirkpatrick (D), who unsuccessfully ran for Senate last year and then moved to this district from her old seat, AZ-1, is the Democratic leader. But Kirkpatrick faces a competitive primary against a few other candidates, including 2016 McSally challenger Matt Heinz (D). A late primary is a pain for Democrats, but given the likely environment later this year, President Trump is a drag in a district that was decided by razor-thin margins in 2012 and 2014. It may seem odd that we now list a seat that Trump won by nearly five points, NJ-2, as among the likeliest Democratic pickups. However, the retirement of Rep. Frank LoBiondo (R), a labor-backed Republican who has been effectively untouchable since his first election in 1994, coupled with the candidacy of state Sen. Jeff Van Drew (D), a moderate who is very popular in his Republican-leaning district, makes holding this seat an uphill battle for Republicans. One rumored GOP candidate, former Atlantic City Mayor Don Guardian (R), has already passed on running, and some of our New Jersey sources see Van Drew as an early leader in this district despite its turn toward Trump. A GOP candidate did just emerge, former FBI agent Robert Turkavage (R), though he registered hardly any support in an independent bid for the U.S. Senate in 2012. While the districts are moving in different directions — AZ-2 went from backing Mitt Romney to voting for Clinton, while NJ-2 supported Barack Obama in 2012 before backing Trump — Democrats have a good chance to flip both. We would be much less bullish on their chances if there was a Democrat as opposed to a Republican in the White House. The retirement of Rep. Ileana Ros-Lehtinen (R, FL-27) last spring immediately made her South Florida district the top Democratic pickup chance in the whole country, and nothing has happened since then to change that. The Democrats have a big primary field that seems likely to produce a strong nominee, while Republicans have had trouble recruiting a candidate even though the party is historically quite strong in South Florida. However, songwriter Angie Chirino (R) is gearing up to run; she has worked with artists such as Jennifer Lopez, Gloria Estefan, and Marc Anthony, and her father, Willy Chirino, is a Cuban pop star. So maybe a nontraditional candidacy can help the GOP in this district. There was already a big Democratic field challenging Rep. Darrell Issa (R, CA-49), and rumors that he might be interested in running in CA-50, a much redder district held by Rep. Duncan Hunter (R), suggest that Issa was skeptical of his own reelection odds after what was by far the closest call of his career in 2016. The retirement of Rep. Ed Royce (R, CA-39) in a district Clinton won by nearly nine points puts Republicans in a similar predicament as CA-49, although Issa was tested in 2016 in ways Royce was not, so perhaps CA-49 is becoming Democratic down the ballot faster than CA-39. It is worth noting that some California analysts think that Democratic exuberance over these Southern California retirements is overstated because both seats are historically Republican down the ballot. Even in a wave year, history suggests that the party on the wrong side of the wave will still capture a seat or two from the winning party. True, Republicans failed to win a single Democratic seat in 2006, but that was the first midterm since 1922 where the non-presidential party didn’t see at least one of their seats flip to the other party. If Republicans do pick up at least one Democratic-held seat, their likeliest pickup would be MN-1, which Rep. Tim Walz (D) is leaving to run for governor. Trump carried the district by about 15 points after Obama narrowly won it in 2012. Two compelling Democratic targets come next, MI-11 and WA-8. The former is more Republican-leaning, but the latter has arguably the best open swing seat Republican recruit in the country, Dino Rossi (R), who lost three very competitive statewide bids for Senate and governor last decade but ran well in this district and had a huge initial fundraising tally. Up next are two other open Democratic seats, NH-1 and NV-3, both of which Trump won but only narrowly. Democrats probably have the stronger candidates in each so far, and it would ultimately be at least a little surprising if the Republicans could win either. We’re going to hold NH-1 at Toss-up because the Granite State can be so contrarian, but NV-3 moves to Leans Democratic: As a district that is more diverse than the nation as a whole and has slightly higher-than-average levels of educational attainment, it tracks as a district where the president likely will be a drag. Democrats are also favored to hold NV-4, where Rep. Ruben Kihuen (D) is leaving after just one term due to sexual harassment allegations. Republicans liked the candidacy of Las Vegas City Councilman Stavros Anthony (R), but he just left the race because of health issues. That could open the door for former Rep. Cresent Hardy (R) to try to win his seat back after losing it in 2016. Deeply Republican Kansas can be a tease for Democrats, as former state Minority Leader Paul Davis (D) discovered the hard way when he lost to unpopular Gov. Sam Brownback (R) in a 2014 surprise. But Davis is taking a crack at the open KS-2, and he may be better-funded than the eventual GOP nominee in a district that nonetheless is heavily Republican. Democrats are circling this seat as one to watch but Republicans are still favored. The Republicans are also favored to hold PA-15, where moderate Rep. Charlie Dent (R) is retiring, but the seat is more competitive than Dent’s strong reelection performances (and Trump’s seven-point districtwide 2016 win) would lead one to believe. Longer-shot open seat targets make up the rest of the list. One we’re adding to our competitive seat ratings is FL-6, which Rep. Ron DeSantis (R) is leaving in favor of a gubernatorial bid. The seat is very Republican — Trump won it by 17 points — although Democrats have an interesting challenger who has raised legitimate money, former Clinton administration deputy National Security Adviser Nancy Soderberg (D). We thought about listing this seat as Likely Republican before DeSantis left to run for governor, so it stands to reason we’d list it now that it is an open seat even though the eventual Republican nominee will be clearly favored. Table 3 shows the other 28 seats, which are rated Safe for the incumbent party. These seats are listed in alphabetical order by state (and by district number within states). Note: *See the “P.S.” section below for more details on how we made this list, including why the vacant MI-13 seat is listed here but not other vacant seats. We included Rep. Jim Bridenstine (R, OK-1) as a retiring member because he has indicated he will not run for another term even if he is not confirmed as NASA administrator and, if he is confirmed, Oklahoma likely will not hold a special election for the seat, according to the Tulsa World. So OK-1 seems likely to have an open seat next November one way or the other. Last summer, we looked at how the presidential and non-presidential parties fared in open-seat House races over the past three midterms compared to the preceding presidential year. All three midterms — 2006, 2010, and 2014 — were backlash elections against the White House, and we found that the performance for the presidential party dropped significantly from the presidential year to the midterm in seats both with and without an incumbent, but the open seats saw a bigger drop. In 46 open seats held by the presidential party, that party lost an average of 22 points in margin from the performance of the incumbent in the previous election, and the non-presidential party flipped 21 of them. In 48 instances where the non-presidential party defended an open seat, the margin for the new candidate hardly changed at all on average from the performance of the incumbent in the previous election, and only one flipped to the presidential party. These are not large sample sizes, to be clear. But if we applied that 22-point loss in margin to the 31 open Republican seats, the Democrats would win 11 of them. That includes some of the obvious targets on the list of competitively rated seats, but also one of the seats we currently call Safe Republican, TX-6. To be clear, we don’t think this average is going to materialize everywhere. But it does show the potential damage Republicans could take to their majority just in open seats. Looking ahead, we think it’s fair to say that in order for Democrats to net the 24 seats they need to win the House, they likely need to net at least a half-dozen seats from the group of open seats. As it stands now, we think they’re outright favored to win four open GOP seats, and they have roughly even odds in an additional three. The Republicans, meanwhile, have at least one prime open-seat target, MN-1, and a few others. There are several other mostly-but-not-exclusively Republican open seats that should feature competitive races, and this list of open seats is likely to grow longer, perhaps considerably so. So open seats are a key part of a potential Democratic House takeover, but the majority of Democratic gains will have to come from beating GOP incumbents. That’s only natural: Remember, even though 46 seats are currently open, that means that the lion’s share of members — 389 — are seeking reelection. Let’s say Democrats do meet our standard and net a half-dozen seats or so out of the open seats. That means Democrats would need to defeat about 15-20 House Republican incumbents to win the House when combined with their net gains from open seats. That may sound like a lot, but historically it’s not a very high bar. Going back to 1954, there have been 16 midterms. In nine of those elections, the non-presidential party defeated 15 or more presidential party incumbents, according to Vital Statistics on Congress (the presidential party never did this in any of those midterms). In any event, the growing number of open Republican seats gives Democrats some appealing targets. But their path to a House majority is much more dependent on beating Republican incumbents. Our list of 46 open House seats does not include three vacant seats previously held by former Reps. Trent Franks (R, AZ-8), Pat Tiberi (R, OH-12), and Tim Murphy (R, PA-18). All three seats will be filled by special elections later this year and, presumably, the winners of those special elections, who will be incumbents, will be on the regular November ballot. The list does, however, include the seat that was most recently held by former Rep. John Conyers (D, MI-13), because a special election for the seat is being held concurrently with the 2018 midterm and therefore the regular November election is not currently slated to feature an incumbent. Late last week, we changed the rating of the PA-18 special from Likely Republican to Leans Republican. Republican outside groups are starting to pump money into the district, and President Trump is visiting on Thursday (today). We still think the GOP is clearly favored to hold a seat that Trump won by 20 points but the attention the party is paying to the seat and the Republicans’ typical underperformance in special elections so far this cycle informs this rating change. One of the outside GOP groups helping in PA-18, the well-heeled Congressional Leadership Fund, has been opening field offices across the country in vulnerable House districts. Almost all of the districts CLF has targeted for field activity this cycle have been clear battleground seats, but one curious selection was WA-5, held by House Republican Conference Chairwoman Cathy McMorris Rodgers, the fourth-ranking Republican in the House. The eastern Washington district has been held by Republicans ever since George Nethercutt (R) defeated then-House Speaker Tom Foley (D) as part of the 1994 Republican Revolution, and Trump carried it by about a dozen points. McMorris Rodgers is still a significant favorite but the CLF involvement is telling, as is the presence of a credible Democratic challenger: Lisa Brown, a former state Senate majority leader and university chancellor. We’re moving it on to the competitive board as Likely Republican. Finally, Rep. Cheri Bustos (D, IL-17) benefited from a “retirement” of sorts earlier this week: Her top likely opponent, developer Mark Kleine (R), dropped out of the race. Kleine had raised an impressive amount of money and might have pushed Bustos a little bit in a blue collar district that Trump narrowly won (after Obama had comfortably carried it in 2012). With Kleine out of the picture, IL-17 moves to Safe Democratic, even though a district like this could be a Republican opportunity in the future.